NYC, 02/19/2019, 6:00PM. 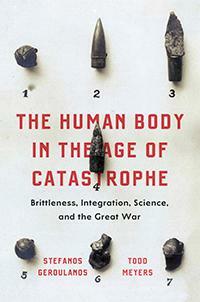 The Human Body in the Age of Catastrophe: Brittleness, Integration, Medicine, and the Great War. In The Human Body in the Age of Catastrophe, Stefanos Geroulanos (Professor of History) and Todd Meyers (Associate Professor of Anthropology) uncover a fascinating story of how medical scientists came to conceptualize the body as an integrated yet brittle whole. Responding to the harrowing experience of the Great War, the medical community sought conceptual frameworks to understand bodily shock, brain injury, and the vast differences in patient responses they occasioned. Geroulanos and Meyers carefully trace how this emerging constellation of ideas became essential for thinking about integration, individuality, fragility, and collapse far beyond medicine: in fields as diverse as anthropology, political economy, psychoanalysis, and cybernetics.